Lacy fingerless mitts and kerchief are both worked in the same pattern of V-stitches from different angles, creating an airy fabric with plenty of stretch. Perfect for life on the island or a cool summer evening. We recently closed preorders for our Fall Ficstitches Yarns Kit Club, so I am ready to share the design from our Spring Kit. 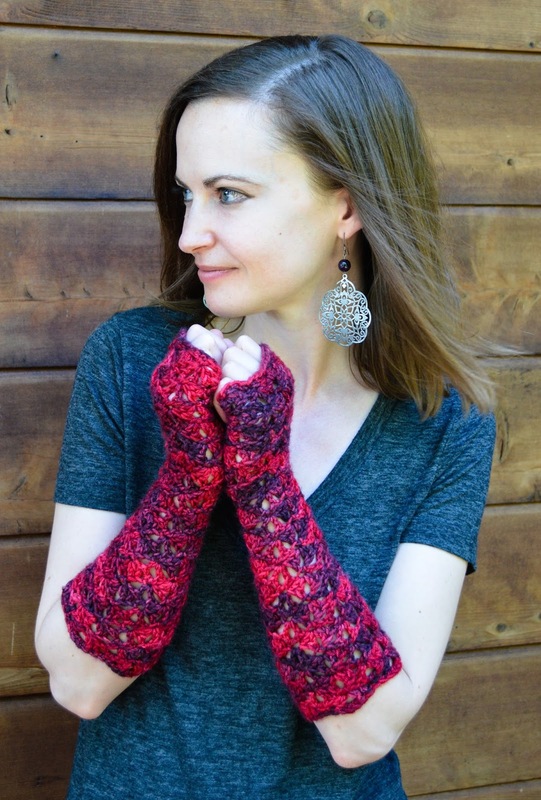 Deirdre's Kerchief and Summer Mitts were inspired by the lead character in The Soldier's Stitch by C. Jane Reid, which was published exclusively for our Spring Kit Club, but will be published on it's own in just a few months. The Kerchief and Mitts are worked in a brand new Sport weight MCN (merino/ cashmere/nylon) yarn from Black Trillium Fibres called Sunriver. The pattern uses about 1 and a 1/2 skeins of 330 yards in Sport weight, so you will need 2 of most standard skeins. As I often am with lacy patterns, I was inspired by a stitch pattern I came across in a Japanese Stitch Dictionary. If you haven't used one before, these are entire books of nothing but stitch diagrams for a variety of patterns. But after a little experimenting and swatching, by the time I finish with it, the stitch pattern seldom resembles the one I was inspired by. In this case, I wanted to work out how to increase from a small point (at the bottom of the kerchief) by adding a few stitches on each side of every row. I actually sketched out the stitch diagram first to determine how I would work the increases. This is very unusual for me, as I am very much a process driven designer and tend to work the pattern out as I go. 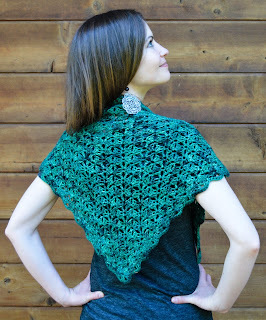 I was so taken with this particular lace pattern and the idea of creating a triangle from a small point, that I have already developed a couple of other designs using the same combination of alternated rows of V-stitches and 2dcV-Stitches. For the Mitts, I used the same lace pattern worked back and forth from the fingers down. The stretchiness of this lace pattern lends itself really well to these one-size gloves. As with most of my patterns, I include alternative design suggestions to make it your own, which may help you adjust the Mitts to fit your hands or make the Kerchief into a larger Shawl. Now you too can crochet this charming set of lacy kerchief and fingerless gloves. 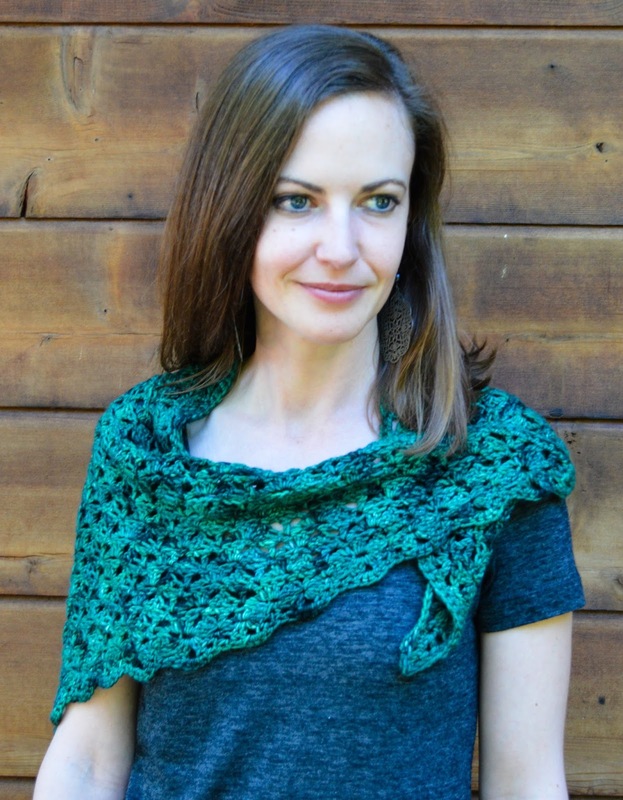 The pattern, including detailed stitch diagrams, is now available on Ravelry. With adding this pattern to my designs on Ravelry, this makes my 100th design! 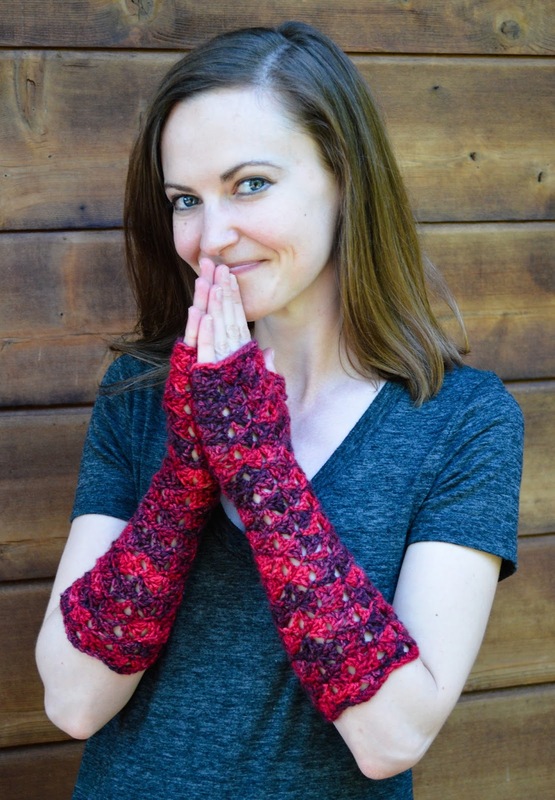 So I would like to offer a $1 off coupon for Deirdre's Kerchief and Summer Mitts for the first 2 weeks (until Thursday August 25th). Use Discount Code: "100Designs" on the Ravelry!